The Chobe River, in the far north of Botswana, forms the boundary between Botswana and the Caprivi Strip of Namibia. 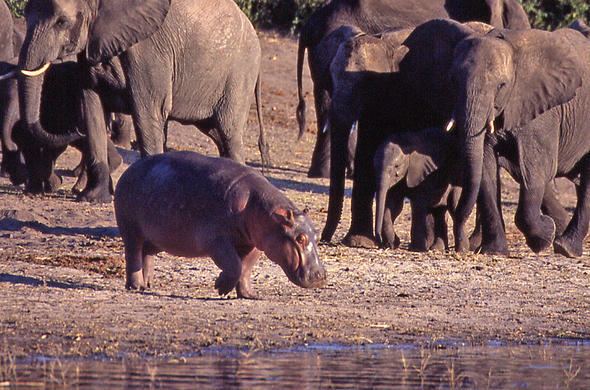 Famous for its large herds of elephant and buffalo the Chobe also plays host to a menagerie of other wildlife. During the dry season, as the water dries up in the vast Botswana wilderness, wildlife is drawn to the permanent waters of the Chobe River. 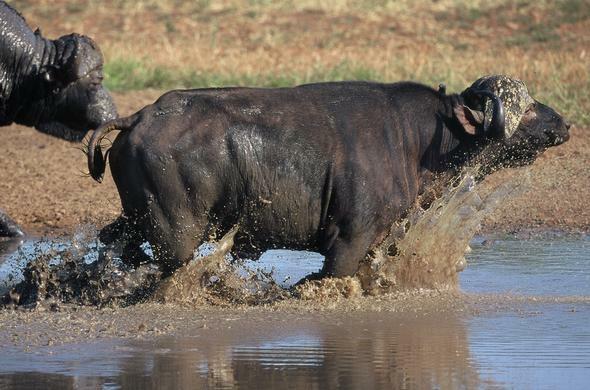 It is not uncommon to see thousands of buffalo side by side with hundreds of elephants on the floodplains of the river. The dust from the hooves of these vast herds can be seen from miles away. The Chobe is known to have the highest concentration of elephants on the African continent. But why is the elephant population so large in Chobe? The answer lies in human conflict and in particular the liberation era in Africa. Historically, and even as recently as thirty years ago, the Chobe River was merely a stopover for wandering herds of elephant as they travelled through northern Botswana, the Caprivi Strip of Namibia, south eastern Angola, western Zambia and north eastern Zimbabwe. Civil war and a war of independence put a stop to this movement. Civil war in Angola and a war of independence in Namibia resulted in the elephants, and other wildlife, being poached for food for the armies. Skins and ivory were harvested to sell to buy weapons for the war. This resulted in the elephants staying back in the safe haven of the Botswana side of the Chobe River. The Chobe River is the southern-most range of the puku antelope, a family of the lechwe for which it is sometimes confused. Common in its northern range the puku occurs along the floodplains of the Chobe River where it is seen in the wetter areas. 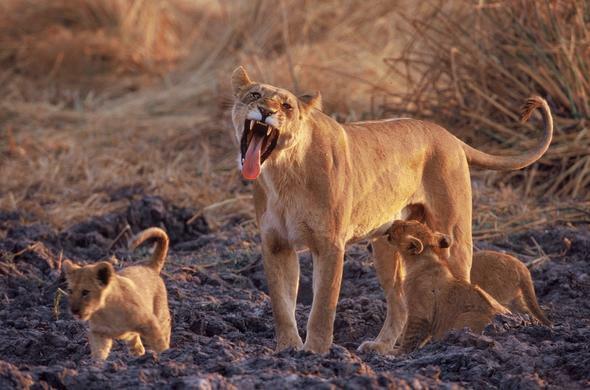 Predators, and in particular lions, are active along the Chobe floodplains. Preying on the large herds of buffalo the lions have been known to kill more than they can eat when the food is plentiful. Personal observations have shown a lioness walking from a buffalo kill to drink water in the river and finding a slow moving buffalo cow separated from the herd - and as full as the lioness was she killed the weakened buffalo. The carcass was fed on by vultures and jackals over the next few days. The Chobe River is also the haunt of the hippo where the floodplains provide rich grazing and the sandbanks are ideal for 'sunning' themselves. Birdlife along the river is prolific, in particular during the summer months when the migrants have arrived in force. The African fish eagle screams over the floodplains as storks, herons and egrets patrol the river bank. Kingfishers abound and a number of ornate bee-eaters and rollers add to the kaleidoscope. In the dry season vultures patrol the skies as the predator activity increases. 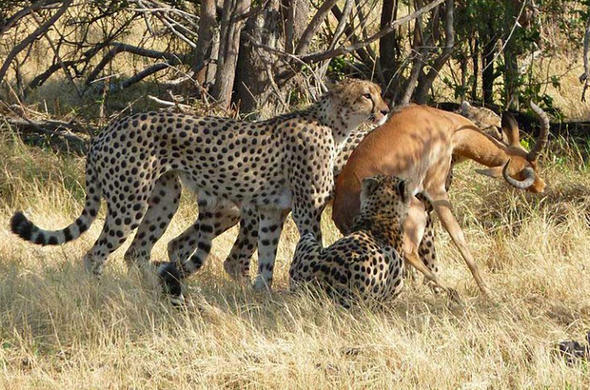 With the large herds in the area the predators such as lions kill regularly and there is plenty for the scavengers.